Would you think to look in Queensland for records of a burial or funeral service that took place overseas, including New Zealand, the United Kingdom, Ireland, Fiji, Sweden, Greece, Hungary, Austria or the Netherlands? 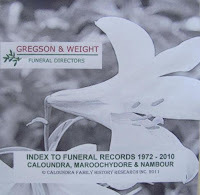 Cemeteries and crematoria from all of those countries (plus all parts of Australia) are mentioned in records of Gregson and Weight, funeral directors at Caloundra, Maroochydore and Nambour on Queensland's Sunshine Coast. I recently bought Caloundra Family History Research Inc.'s new index (on CD-ROM), Gregson and Weight Funeral Directors, Caloundra, Maroochydore and Nambour - Index to Funeral Records 1972-2010. It lists (in PDF format) about 20,000 names (in two sections, 1972-1999 and 2000-2010), with surname, given name, age, death date or funeral date, place of burial or cremation, and a reference number. Aliases or nicknames are sometimes shown. Appendix 1 lists all cemeteries/crematoria mentioned, and explains how to contact them. Appendix 2 lists hyphenated or 'double-barrelled' surnames, which were not always recorded correctly in the index. This very affordable index will be invaluable for finding deaths that are too recent to be in online civil registration indexes. There is a good explanation of abbreviations and the arrangement of entries, and a contact address for Gregson and Weight; but although the introduction says, We would be pleased if researchers would advise us of any inaccurate information, the author/publisher's address is not shown. The publication also lacks a proper title page (which should show title, author, publisher, date and place of publication, copyright notice and ISBN). For more details about the index, contact Caloundra Family History Research. Postscript, 2014: There is now an online database for various other Queensland funeral directors' records including Alex Gow, K.M. Smith, Cannon and Cripps, Metropolitan, Tucker and Nankivel, Lorisch, and Le Grand. This sounds like an excellent source! I am looking forward to using it! Strange to think there will be close family members in the index.